Scientists have revealed how Earth may have got its crust. Before it split into the continents we know today, it was formed from gigantic pools of molten rock caused by asteroids bombarding the planet, researchers say. It occurred more than 3.8 billion years ago, in a time period called the Hadean eon, and the giant pools were tens of kilometres thick, and thousands of kilometres in diameter. At the time, most of these surface rocks on Earth were basalts, and the asteroid impacts produced large pools of superheated impact melt of such composition. ‘If you want to get an idea of what the surface of Earth looked like at that time, you can just look at the surface of the Moon which is covered by a vast amount of large impact craters,’ says Professor Rais Latypov from the School of Geosciences of the University of the Witwatersrand in South Africa. However, ressearchers are still baffled by exactly how the ancient, giant melt sheets became the ‘protocontinents’. One theory is that, on cooling, they may have crystallized back into a similar type of rock, wiht asteroid playing no part. An alternative model suggests that these sheets may undergo large-scale chemical change to produce layered magmatic intrusions, such as the Bushveld Complex in South Africa. 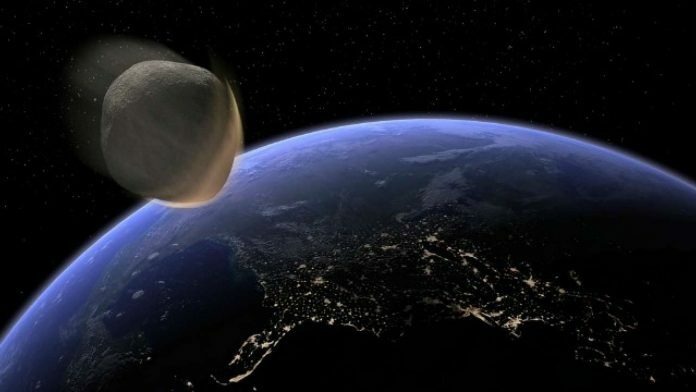 In this scenario, asteroid impacts may have played an important role in producing various igneous rocks in the early Earth’s crust and therefore they may have contributed to its chemical evolution. By studying the younger impact melt sheet of the Sudbury Igneous Complex (SIC) in Canada, researchers found that ancient asteroid impacts were capable of producing various rock types from the earlier Earth’s basaltic crust. Most importantly, these impacts may have made the crust compositionally more evolved, i.e. silica-rich in composition. The SIC is the largest, best exposed and accessible asteroid impact melt sheet on Earth, which has resulted from a large asteroid impact 1.85 billion years ago. This impact produced a superheated melt sheet of up to 5 km thick. The SIC now shows a remarkable magmatic stratigraphy, with various layers of igneous rocks. ‘Our field and geochemical observations – especially the discovery of large discrete bodies of melanorites throughout the entire stratigraphy of the SIC – allowed us to reassess current models for the formation of the SIC and firmly conclude that its conspicuous magmatic stratigraphy is the result of large-scale fractional crystallization,’ says Latypov. ‘An important implication is that more ancient and primitive Hadean impact melt sheets on the early Earth and other terrestrial planets would also have undergone near-surface, large-volume differentiation to produce compositionally stratified bodies.